This traditional 17th Century self catering studio apartment in a Provence village square is tastefully decorated and stylishly furnished. The ceiling has original oak beams. The village is north of St. Tropez. The apartment consists of two rooms. A large main room with a double bed, large sofa, small table, wardrobe and fitted kitchen. The other room has a shower toilet and large wash basin. The village is lively all year round and the studio has immediate access to local restaurants, bars, shops and facilities. This gives you all the benefits of a hotel. You decide if you want to eat in our out. You can choose from an inexpensive snack to several critically acclaimed restaurants recommended in the Provence-Cote D'Azure Guide Gantié. Coffee is served in the café downstairs from six in the morning. There are over 8 restaurants and bars in the village, 5 of which are less than 300 meters from the house. The nearest supermarket and 3 bakeries are all less than 500 meters away. Flayosc is a charming Provençal village with a fully-restored central square shaded by age-old plane trees, and an ancient fountain listed as a historical monument. With traditional "boules" contests, narrow streets, delightful old houses. 300 days of sunshine a year, this area is ideal all year round. With wonderful walks climbing, canoeing golfing and colourful provençal markets. The wonderful wines of this area are not to be missed. The Flayosc area is relatively unspoilt with 200k of walks and mountain bike trails. Explore the areas on horse back, on foot or by bike. Studio Mimosa was great! It feels quintessentially French and looks exactly as per the photos in the listing. It overlooks the village square, so location is brilliant. Communication with Adrian was very easy and he's been helpful throughout. I picked up the keys in a lockbox and everything in the apartment was ready for me. I would highly recommend staying here! A great spot in the south of France. Stayed here for a week in early April 2016. Great location for Gorge du Verdon, Grasse, hilltop villages such as Faynece and Sellians and of course just 40 mins from the coast. We were blessed with great weather. The studio is in the centre of the village - very convenient to the local cafes and restaurants. The studio has everything you would need for a very comfortable stay including WiFi. All in all a great trip. I would definately recommend this holiday rental to a friend. It's a gem! We love it here & Studio Mimosa suits us perfectly. What a super base to visit this fabulous Region. All good! What a spot! Studio Mimosa provided the perfect home to our holiday escape! It provided everything we needed during our stay. Very beautiful. We will definitely be rebooking for next year! Nice and confortable stay. Had everything we needed. Beautiful little town and breathtaking area. Studio Mimosa is a wonderful gite and so central to the beautiful little town. We had a lovely week exploring Flayosc. The Tournist Information office has a walking tour - well worth it for the 'treasure hunt' of hidden sites - especially the canals. We had a lovely time in Flayosc. Ate very nice food in the square. Enjoyed the food market in Flayosc on Monday antique market in Lorgues on Thursdays. We really enjoyed our stay at the Mimosa Studio, Flayosc was a perfekt location for eksperience the area. We will defenetly recomand it to our friends. Lovely studio apartment in the middle of a quiet little town in the hills of Provence. Does exactly what it says on the tin & ideal base for exploring the surrounding countryside. Very quiet at nightime with nothing open past ten but we were there at Easter & it may well be livelier during the summer. Rental car essential for travelling around the surrounding area. Some fine eateries in the town & we ate very well while there. Ideal for couples on a relaxing holiday. Overall a very enjoyable experience in rural Provence. A chaming good appartment in a old house. The surrounding was calm and unstressable. I recomend this appartment. We have had awonderful week here in Flayosc. Many thanks for an authentic Provençalexperience - we have loved sitting at the table by the window eatingcroissants and listening to the babble below. We have enjoyed visitingAups. Moustier Ste. Marie and Cotignac and have also been drawn back toour favourite beaches: Tahiti (St. Tropez) and La Lavanou - the stripof sand above the main beach is especially lovely. Although Frejus and St. Raphael are closer, we would not recommend visiting them. Had a fantastic week here in Studio Mimosa in Flayosc - great appartment, lovely village. Neverwould have expected to eat so well. Obviously the fine dining inL'Ostaou (more expensive, but worth it) but the others just as good intheir own right (and more easy on the purse!). the surrounding area isamazing, som many places to visit and explore - the highlights (nolowlights!) were: 1. Sillians La Cascade - amazing waterfall, crystalclear water 2. Gorges du Verdon/Lac de Ste. Croix - wonderful scenery,beautiful place to picnic at and swim in. Of the beaches we tried, LaNartelle (to the east of Ste. Maxime) would not recommend - busy &dirty water and L'Elephant (sic), a bit further up the coast towardsSt. Raphael - much, much nicer - can park your car right at the beach... But really it's all good, we'll be back. A great 2 weeks inthe region, our first time. Flayosc is well situated to go to lots ofplaces. All of the small towns we sweet and lovely, and good restaurants - but the best were in Flayosc. We had a lovely week here,did lots of walking in the Verdon region, the weather was fantastic allweek & the flat is perfectly positioned to go all over the region.One tip, go to the boulangerie furthest down the street, the croissants are great. This is a really lovelystudio in a beautiful location. Flayosc was a great atmosphere, veryfriendly locals and lots going on. We ate at L'Ostaou once - it wasgreat food (but took 1hr to get a drink - don't go if you're in a hurryor thirsty!) The other bars/restaurants all served good hearty fare. Wewould Highly recommend driving to the Lac de Ste. Croix for a picnic bya beautiful lake and a swim/pedalo/boat ride. We asso tried to visitthe Gorges du Verdon - drove round and saw it in all it's glory butcouldn't find where you could pedalo in it - check with locals to findout before you set off, it's a long drive. We are sure to come back to do more exploring. We lovedStaying in Studio Mimosa and making this our home for a week. Excellentlocation! Charming, shabby chic décor. Wonderful shops, wines, antiques, patisseries & restaurants. Quiet at night. After all the villageswe visited, Flayosc was our favourite to come back to at night. Thank-you! Charming apartment. Beautiful area. Loved every minute of our stay. Everything we neededhere in Studio Mimosa. Well situated - enjoyed nearly all the cafés& boulangeries & most of the other shops! Very friendly. Alsohad a good birthday meal at L'Ostaou. If you find yourself in Riez, LeRempart next to the bell tower does fabulous food. Highlights of visit- the Gorges du Verdon - amazing (& we have both been to the GrandCanyon in US). We also liked Tourtour & many other villages. Firstvisit to Provence - hope it won't be the last. The sunshine & blue sky most days were icing on the cake. 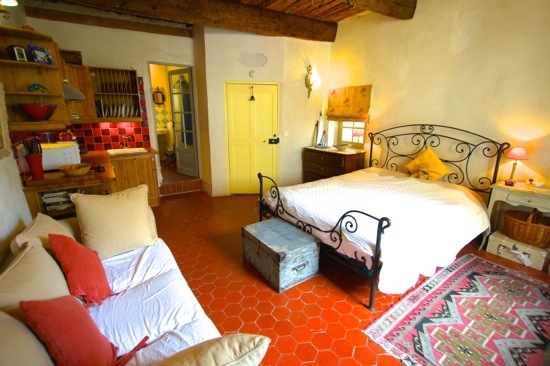 Compact, livelyStudio in the heart of a typical provencal village (no tourist shopsetc). Wonderful countryside, friendly locals. Each village has it's owncharacter. Highlights were: Gorges du Verdon, Cotignac, Collobrieres& La Garde Freinet. Not forgetting Flayosc! Wonderful choice of restaurants for such a small village. Merci! We had a marvellous stay at the Studio; enjoyed the localmerchants and the fabulous breads, cheeses & wines. We exploredfrom the Gorges du Verdon to the ports along the coast and many of thevillages perched in between. One highlight from a local isSillans-la-Cascade, near Salerns - a 20 minute walk to a delightful waterfall. Merci beaucoup! Made Visits to:St. Tropez, Grimaud, Port Grimaud, Le Luc, Monaco and Gorges du Verdon. Fantastic location, great place in a nice little town! Cheers! Had a wonderful andrelaxing week here. The locals were very friendly and helpful whenever they could be. A welcome reprieve from both camping and Italians. The apartment is charming, as is the village - greatatmosphere & shops in the village, also restaurants. Le Muy marketThursday ( get there early, closes @ 12.30) & Les Arcs stunning - We'd certainly like to come back since a week is too short! A lovely spot, just what we were looking for. We've had a fabulous timehere! The place is absolutely beautiful and everyone is very friendly.Take a trip to the beach at St. Raphael and canoe at Roquebrune! We also had the best food of our lives right outside at L'Oustaou. Thanks! Enjoyed our stay.Visiting Tourtour, Lac de Ste. Croix, Les Arcs old village, Ste. Maxime beach and some of the vineyards. Simply wonderful. Great spot for touring. Lively little village, some great musicians at a couple of reasurants - Vive la France! We have really enjoyed our stay and will be back. We had afantastic holiday & really enjoyed our stay in Flayosc. The centrallocation of Studio Mimosa has been great & we loved it's rustic charm. Had alovely time staying at Studio Mimosa. We found it to be an excellentbase for exploring Provence. Great little cafés & restaurants right on the doorstep - We'll be back. Lovely little studio, everything we needed. We loved the area, the food. the wine and scenery. Very convenient with eleven restaurants and three boulangeries. We will have to come back try them all.